Kirk McElhearn is here to help you with your iTunes questions. When your media library grows, you need better ways to view your content in iTunes. In this week’s column, I answer two questions about viewing media. The first discusses a better way to view music by genre. The second explains why some TV shows aren’t separated by season and how to fix this issue. With a little bit of work, you can view each of your media kinds more efficiently. Q: I have a large music collection that includes many genres. I’d like to be able to see all my artists and albums in a particular genre. For example: I’d like to listen to some jazz but I’m not sure which album, so I’d like to be able see at a glance which artists I have to choose from. The current choice seems to be an album cover shot along with a list of songs on the album. This limits the information in the screen to about one album at a time. Is there any better way to view albums by genre? 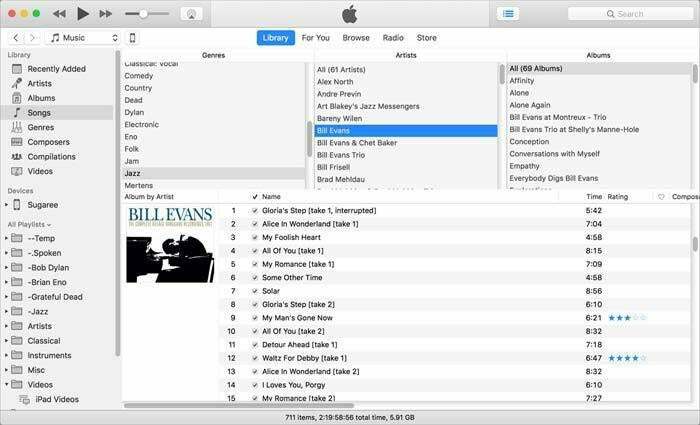 iTunes offers several ways to view your music. You can view it by Artists, Albums, Songs, Genres, or Composers. All of those views, with the exception of Songs, display a column with a list of names. You can then click one of them—say a genre—to see its contents, but you need to scroll a lot to do so. As you say, this isn’t the best way to view music by genre, where you want to see as much as possible. I generally view my library by Songs (click Songs in the sidebar), with the the Column Browser visible (choose View > Column Browser > Show Column Browser, or press Command-B). Viewing my jazz collection in iTunes using the Column Browser. As you can see above, I’ve selected Jazz in the Genres column, and I’ve scrolled the Artists column to choose Bill Evans. If I want to listen to a Bill Evans album, but I’m not sure which, I scroll the Albums list to make my choice. I could choose another artist in the Artists list, or I could browse all the albums by all my jazz artists by scrolling the Albums list. Songs view is a bit spartan, but it is great for drilling down in your music collection. There is another option. Create a smart playlist with the condition Genre is Jazz and browse that to make your choice. You can choose any view you want for that playlist: you could choose Albums view and just see album artwork if you’re the visual type who chooses music based on covers, or you can choose Artists or Songs view to see the music differently. You might not want to make smart playlists for all your genres, but there are probably some where you want to be able to browse more efficiently. Q: I have several seasons of TV shows that iTunes has categorized as “unknown” in my TV Shows library. How do I fix them so the seasons display correctly? When you want to watch one of your favorite TV series, it’s good to have the episodes sorted by season, so you can easily see where you are in that series’ timeline. iTunes does this, if the files are tagged correctly, but I’ve found that for multi-season TV series that are sold in a “complete” bundle, and for some other TV series, the iTunes Store doesn’t tag them for seasons. 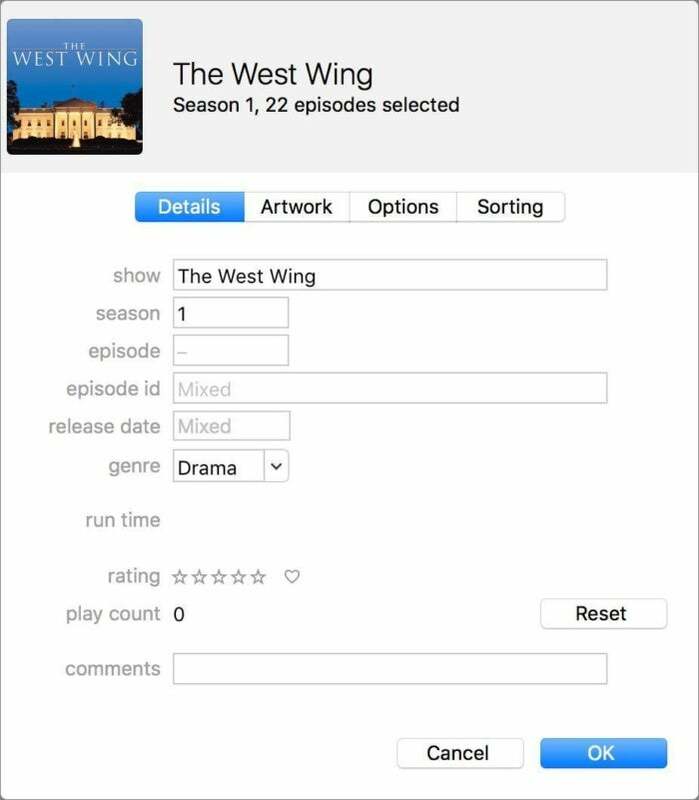 For example, if you buy The West Wing from the iTunes Store (it’s the only way to get that series in HD) you’ll get one big list of 155 episodes plus an extra documentary episode. If you buy The Wire, you get 60 episodes plus three shorts. When I purchased these series, I had to manually apply seasons to them because the iTunes Store (incorrectly) views them as a long stream of episodes, rather than a number of seasons of episodes. This is easy to do, but it takes some time. Start by finding which episodes belong to which season; Wikipedia is a good place to get this information. For The West Wing, most seasons had 22 episodes, but season 5 had 23 episodes. Select the first set of episodes—those for the first season—then press Command-I. In the Info window, enter 1 in the Season field, and click OK. Do this for the other seasons. As you can see here, I’ve retagged my West Wing episodes. This is a multiple item selection of all of season 1’s episodes, and I’ve entered 1 in the Season field. If you want to renumber the episodes, so the numbers they display correspond to the season and not to the overall episode count of the entire series, use Doug Adams’ Increment Number Tags AppleScript; it can automatically apply episode numbers to a series of files. After you do this, iTunes will display both the season numbers and the episode numbers correctly.